Thought I would cover this seperately as is often wondered about - how much power the inverter uses when on but not being used? The Multiplus, like most (all?) Victron Inverters have the option of setting in a energy saving mode. In the pheonix range, this is called ECO mode; In the Multiplus range, this is called AES mode but is essentially the same thing. My System in total is drawing 10W - But bear in mind this is the ENTIRE Leisure Electrical System at this time, not just the inverter, so includes the Raspberry Pi and various little draws from the monitors and sensors as well. So that concludes the 240V Side of the setup. Any questions or additional info wanted, just ask. I will discuss the last - and possibly one of the most critical for long-term health - aspect of the Electrical setup next, that is the System Monitoring configuration. This is an amazingly informative read Dave, you are to be complemented on your amazingly detailed and easy to follow drawings as well as your reasoning for and behind everything you are doing on the electrical side....... brilliant! Hopefully admin or @Edina will agree and somehow make certain your efforts are made so that they are easy to find by anyone else looking for this kind of help with their cnversions. 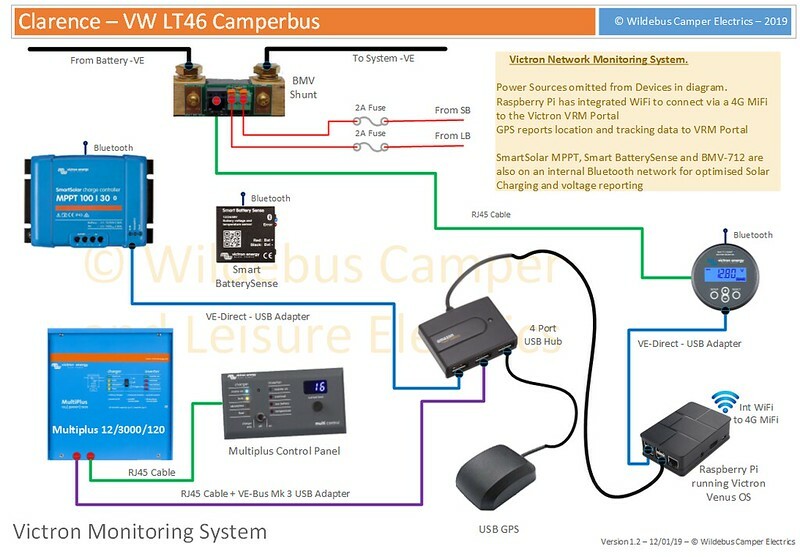 There is a wide range of methods how to monitor the electrics in your Campervan or Motorhome - a writeup is available on my own website here. As well as those examples, many top-range Motorhomes have some very advanced integrated electrical setups, but they tend to integrate the operation of the system (which is great) but rarely cover any kind of advance monitoring of the system. Victron have a great reputation for both their products and the ability to monitor them individually and together via their Venus System and their Remote Management (VRM) Internet Portal. There is a Raspberry Pi microcomputer running Victrons Venus OS software, which is the management system heart (this is a low cost alternative to Victrons own Venus GX or Colour Control GX products); the various Victron devices connect to the Pi via special USB 'Dongles'; The GPS device provides Location and Speed Tracking and can be used as a Tracking and Alarm system as well. The Raspberry Pi is set to read all the data the various devices provide on a minute by minute basis, saving that information and uploading via the integrated WiFi device linking to a 4G MiFi unit and onwards to the Victron VRM Portal which then provides the data in a graphical format for analysis and detailed records. Some of the devices also have bluetooth connectivity to allow them to connect to a Smartphone App and to participate in their own Bluetooth Network. So that is how it is cabled up and connected but what does it actually mean and do? The App allows the devices to be controlled as well as monitored in a similar way. 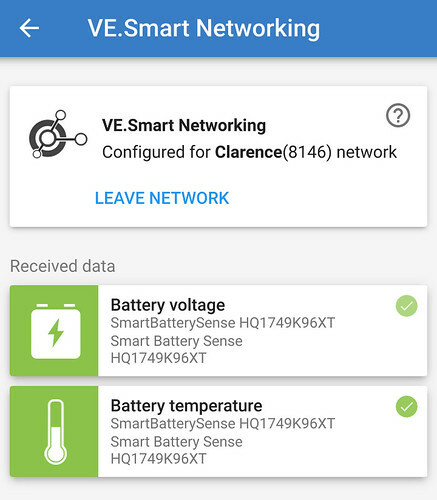 In the screenshot below, it shows the Smart BatterySense, which is a device that connects directly to the Battery Bank and has a temperature sensor, sends info on Voltage and Temp to the MPPT Solar Controller and the BMV Monitor. 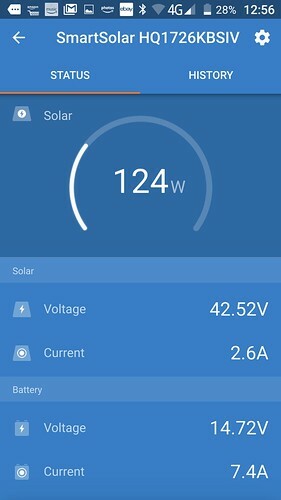 This allows the MPPT Controller to adapt its output voltage dynamically according to the battery temp and specific voltage (thereby bypassing any voltage drops in the cabling from Solar Controller to Battery); and the BMV to show the most accurate voltage possible to calculate the SOC more accurately. Having Bluetooth connectivity is very useful and already extends the monitoring and control of a Motorhomes Electrical system beyond that of most factory installed systems. The next level is to integrate the devices using a Venus system. Victrons main offering is the CCGX - Colour Control GX - Device, a specialist microcomputer with custom ports and a colour screen; and the Venus GX, a similar unit with some additional ports, but no screen. Victron also make their Venus OS open-source, which allows developers to port to other devices, such as the Raspberry Pi for example. I use the Raspberry Pi as my Venus device as it offers a much lower price point. The CCGX lets you see the info directly on its built-in screen, but using a Web Browser, it is also possible to logon to the Venus OS device and see the same info on the screen. And as this is via a Web Browser, it is possible to do this from anywhere (unlike the Bluetooth method, which requires you to be pretty close). Once you have an internet connection on your device running the Victron OS, it is possible to create a FREE account on the Victron VRM Portal (some demos available here) and log your data onto your own secure passworded installation to review and analyse the data in great detail. Or select a full 24 Hours maybe? This view can help determine if you need to adapt and improve any of your systems - storage or charging. The above are just a few examples and the graph view can be as detailed as a 30 minute window going anywhere upto multiple years! All the data is downloadable and Victron say they will keep the data for at least 2 years at the detail level and 5 years for the overview. And all this is free for users of Victron kit. Now the above could be overkill for many, but the thing is it available for those who do want this kind of info. Went to IKEA and bought a new drawer front I have a 100mm high front piece on the sink cupboard where I blank off the bowl, and use it to fit various devices and switches. I needed to rework it after fitting the new Multiplus. Victron Multiplus Control Panel. This is a remote version of the Multiplus Panel with extra flexibility. It adds the ability to change the maximum input current on the fly with the dial control (so in the photo above it is set at 16 Amps). This will be very handy when stopping off at a site with a low power hookup (It won't actually really affect how the electric inside can be used as when the EHU current is reduced, the Multiplus goes into 'Power Assist' mode and makes up the difference using the Inverter. So just end up using a bit of Battery Power and then extra Battery Charging afterwards). Victron BMV-712. Battery Montitor that also has a relay system that can control the Water Heater. Fridge Fan Control. There is a Temperature Probe attached to the Fridge Compressor and goes to this Controller. Once a certain temp is registered, the controller switches on its relay to power a small 12V fan aimed at the rear of the fridge. Water Heater and Water Pump Switch Group. Water Heater - The left switch is a 3-way switch for the Water Heater. In position I, the Water Heater is controlled by the BMV-712 relay which gets enabled depending on the battery SOC Level; In position II, the Water Heater bypasses the '712; and in postion 0 the Water Heater is off. Water Pump - The right switch simply connects or disconnects +12V to the Shurflo pump. 'TBA' Switch. Basically this is not connected to anything at the moment and just a spare. (I think while it is spare I will use this to show a light to tell me when the Water Heater Control Box is getting power. Not essential, but might be a handy reminder as the heater can be a big battery hog if used off-grid). 'GEN' Switch. This is a switch that is connected to the Multiplus Remote Control Panel. When the switch is on, the Current set by the dial control is overridden by a value that has been previously set. I programmed this to 7 Amps to suit my P2200 Generator which has a maximum running power of 1700W to ensure it will not go into Overload. I haven't actually covered the Galley Kitchen yet either, so that will be next post for this build thread. WOW - I have just read (but not understood the electrickery side) this build log from start to finish. A great and very interesting story. Thanks for posting and well done. A much impressed Geoff.